As sweet as cinnamon: 'Out of the Box'....block 1! Here is my 'Out of the Box'- Block One. I am sure you will too. Do you have your Bits and Bobs ready! Then lets start to have fun! Get them out of your sewing box and set them about! Sew the blocks together and then we can play! and also the choice to stitch whichever ones you wish. 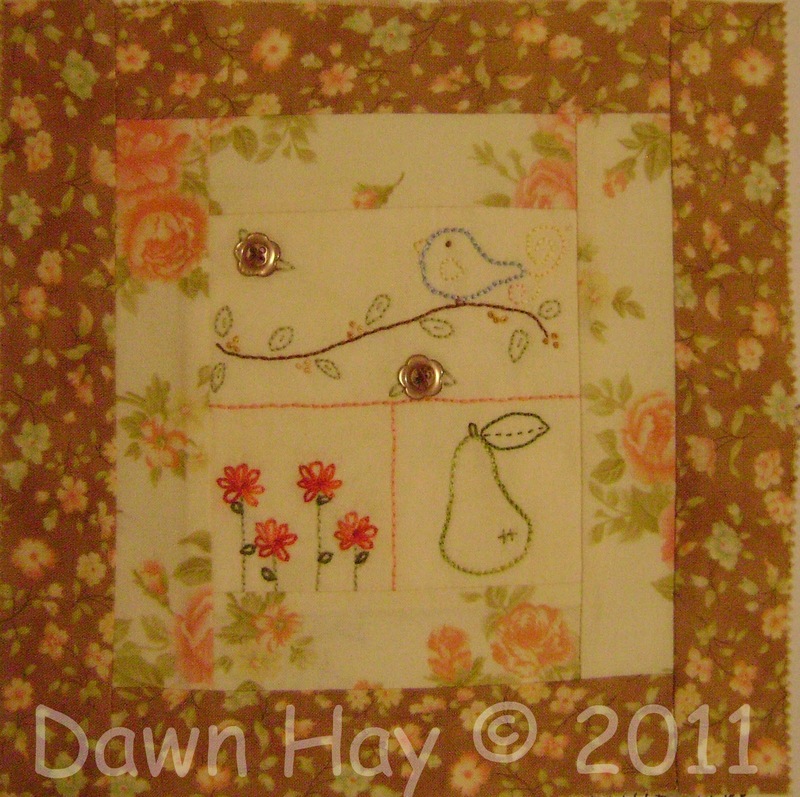 You can stitch my bird and Vicki's apple, designs you choose. that part of the design and place something else in it's spot. A button or Suffolk puff etc will look just as nice. you want the BOM to look at the end. download Vicki's requirements and block 1 as well. Don't forget to join our Flckr group! to enjoy for those who do. So join us as we would love to see your finished blocks. Don't forget Block 2 will be out on February 1st. OMG I'm first ...yay....can't wait to start.....just waiting on Vicki to load her's up. Thanks so much!!! It is beautiful... love birdies!!! I think I may have to stitch both versions!!! Thank you Dawn- I'm supposed to be finishing my UFO's but the temptation is there now to treat myself to start on this too-perhaps a bit of work on this , a bit of work on the others!! It looks great. This new BOM I love, and it's one of my first projects for the coming year. That is so sweet. Love that fabric line too! OMG! How the heck am I supposed to stay on track with my project lists when you've given us this precious piece to make??? And it's only the first block. This is so my style and I just love it. Thanks so much!!! I just love this Dawn. Thank you so much. This is going to be lots of fun. Oh DAWN - this is SO PRECIOUS! I love it, thank you thank you - I think I'll do it just as you did, I think it's perfect! Thank you so much for this BOM and your Design. I'll make both designs. Perhaps I should have made a new year's goal to learn to do stitchery again. I did it once upon a many years ago! :o) Darling block. I like this BOM,this is my first one!! Thank you so much for this BOM. I have finally today solved my problem with downloading 4shared files. Now I can come through again. you naughty naughty girl....you know I'm supposed to be finishing oldies not starting newbies!!! hehehe It's ok.....it's already on my list!!!! I have lots of little charms and buttons to embellish these blocks with--sounds like fun. Hi Dawn, I'm popping in to wish you a happy new year. Looks like you are in for a fun year. Enjoy! Oh Dawn - your block is SO pretty! I can't wait to see this quilt - going to be A-DOR-ABLE! !